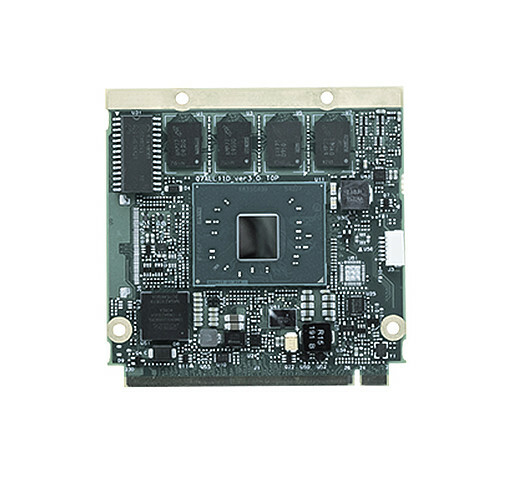 The Qseven-Q7AL module is available with Intel® Pentium® N4200 (Quad Core) processors. Thermal Design Power (TDP) ranges from 6.5 W to 12 W. These offer 2.4 GHz at 6 W TDP or 2.5 GHz at 6 W TDP, respectively. The module can be equipped with up to 8 GByte DDR3-1867 (-1600) Memory Down (ECC in the variants based on Atom processors) and up to 32GB eMMC 5.0 Onboard Flash storage. The Qseven-Q7AL offers a ninth generation Intel HD Gfx graphics controller. The available interfaces include two SATA 6Gb/s, four PCIe 2.0, a serial interface, HD Audio, one I2S, one I2C, one SPI, one camera interface (2x MIPI CSI), one LPC, one CAN, two USB 3.0 (including USB 2.0), four USB 2.0, and an optional USB On-the-Go (OTG). It supports the Windows 10 IOT Enterprise and Linux operating systems. It can be run at temperature from -40 °C to +85 °C for the Qseven-Q7ALi E2 variant. Sampling orders only (1 pcs). RRP means „recommended retail price“. Our range of services and prodcuts is exclusively directed towards companies and businessmen.